Uefa Nations League - France 2 Germany 1 Live! You can watch the Live Match Stream of France Vs Germany via beIN SPORTS CONNECT. World Champions France showed their class coming back from a goal down to defeat Germany 2-1 in Paris on Tuesday evening. Les Bleus were abject at times in the first half but rallied impressively in the second half thanks to two goals from Antoine Griezmann. The contest in Paris was billed as a heavyweight clash as the 2018 World Cup winners faced off against the 2014 champions. Both sides found their way into the contest, but the advantage swung towards Germany with the game just twelve minutes old. Whilst on the counter, Leroy Sane cut a cross from the byline that hit the hand of Presnel Kimpembe. Serb referee Milorad Mazic wasted little time in pointing to the spot, although on second inspection the decision looked harsh on the PSG defender. Toni Kroos stepped up and drilled his shot into the left corner, Hugo Loris got a hand to the ball, which squirmed over the line. Germany had an early lead. France looked out of sorts and failed to find their rhythm for the remainder of the first half. Kylian Mbappé was seemingly the only threat for the French, with his blistering pace troubling the German backline. Although for all the work of the PSG striker, Les Bleus couldn't get past Germany who was warming to the task of shutting out the World Champions. France crafted their best moment of the first half seven minutes from the break when Antoine Griezmann chipped in a perfect ball into the path of an outstretched Mbappé, it was just too long and fell into the arms of a grateful Manuel Neuer. The second half saw France buck up their ideas and press Germany back further into their own half. Mbappé found himself one on one with Neuer with the goal at his mercy. A boot from the German captain denied the teenager a chance to level the tie. France continued to push, and ten minutes later they got their due reward with a moment of magic. Lucas Hernández drilled a cross into the box, and Antoine Griezmann guided a looping header into the back of the net to give the world champions a lifeline. The tie sprung into life and France sensed a winner, meanwhile, Germany went close to taking the lead. Kimpembe carelessly gave the ball away to Serge Gnabry who surged into the box, but his tame shot was gathered by Loris. The tie was concluded minutes later as Milorad Mazic gave awarded a penalty for France as Blaise Matuidi took a tumble in the box under pressure from Mats Hummels. Griezmann stepped up and confidently dispatched the penalty past Neuer to ensure that France kept up their undefeated start to the UEFA Nations League. 90+3 Peep! All over in Paris! What a fightback from France! 2-1 in the end! Match report and the like to follow. 90+1 Dembele speeds away on the counter. Hummels comes in with a perfect tackle! 90+1 France Sub- Tanguy Ndombele is on for Antoine Griezmann. 89- Germany are pushing for a leveller here, but look all out of ideas. We will have three minutes of extra time. 86- Dembele with a pot shot! It's gathered by Manuel Neuer. 84- Mbappe is off for France! Following youngster, Dembele is on for the final five minutes plus stoppage time. 81- Brandt is on for Ginter. An attacking move from Germany! 76- Pogba cracks a shot from outside the box! It hits Mpabbe. Unlucky! 75- Kroos skims in a perfect ball across the box, no German player can latch onto it! That was a chance! 70- Twenty minutes to go in Paris and you just feel this game has a winner in it! UEFA Nations League football...my goodness! 67- Gnabry drives towards the goal! It's gathered by Loris! Kimpembe gave the ball away there! 64- That's Griezmann's first in the Nations League. The replay makes the goal look even better! Magic stuff from the Atletico man! Game on! 61- GOAL! 1-1 France! Griezmann with the leveller! Hernandez launches the ball across the box and Griezmann throws a head at it that flies past Neuer. What a header! 60- It's been quiet, France are pushing for a leveller but have been denied by an organized German backline. 51- Mpabbe one on one with Neuer, The PSG shapes to shoot but is denied by an outstretched boot of the German captain! What a save! Peep! We are back underway! France surely has to be better in the second half, right?! 45- Peep! Half-time! A Toni Kroos penalty is the difference maker! France have been poor and will have to improve in the second half. Join me in 15 minutes for more fun from Paris! 44- Chance for France- Hernandez surges forward into the box, and cuts the ball to Giroud, his first time shot balloons into the Paris night sky. 41- France Free-kick from 40 yards out! Pogba is over it, his shot smashes into the wall. No rhythm from France in this half. 38- France Chance! Griezmann chips in a delightful ball to Mbappe! It's just a tad too long, The PSG striker is on the stretch, but Neuer gathers. 35- Paul Pogba don't look happy. Les Bleus have looked so poor in this half. 31- German defender Thilo Kehrer finds himself some space on the right wing, his attempted cross flies out for a goal-kick. 28- Ginter picks up a yellow for a tackle on Griezmann, The Stade de France roars in approval! 23- France are all over the place here! Ginter latches onto a knockdown and Loris palms it away! 20- France are losing their shape, and don't look like World Champions based on this showing in the first 20 minutes! 17- It could have been 2-0. Sane on the breakaway overhits the pass to Timo Werner, Loris gets a glove to it and France survive! 13- Goal! Toni Kroos from the penalty spot. Loris gets a hand to it, but it squirms in. 12- Penalty Germany. Sane's cross is handled by Kimpembe. That's harsh in my book. 10- Germany pile forward. Gnabry lays the ball off to Sane, but Loris is on hand to quickly boot the ball clear. 5- Hernandez makes way on the right wing but comes into trouble from the German defence. Griezmann gets involved, Germany quickly win the ball back. 4- A rather tepid start to proceedings here. France is knocking around the ball with intent. Griezmann has a pop shot from distance which slips well wide. Peep! Germany get us underway! Right! The teams are out! Time for some football! Live Updates and goals as they go in! Just look at the grimace on the face of Joachim Löw. He could be out of a job if Die Mannschaft suffer a heavy defeat tonight. Now for Germany! Niklas Sule is in for the injured Jerome Boateng. Leroy Sane keeps his place in the team after the 3-0 defeat to the Netherlands last weekend! Team News! France first! Kante & Mbappe are back in the team. Olivier Giroud leads the line! Les Bleus boss Didier Deschamps knows that a victory for his side would mean one more step closer to reaching the Finals which are set to take place next summer. It was a 0-0 draw between the two sides when they last met, in their first ever Nations League contest. France went on to secure a 2-1 win over the Netherlands to take leadership of Group 1A. In team news, France will be without the injured trio of Samuel Umtiti, Benjamin Mendy and Nabil Fekir for the Tuesday evening clash. After resting several key men in their 2-2 friendly outing against Iceland expect the likes of Kylian Mbappe and N’Golo Kante to return to the starting line-up. Atletico Striker Antionne Griezmann has yet to strike in the UEFA Nations League and will be looking to opening his account on home soil. The 27-year old striker has had a slow start to the domestic season fresh from his four goals that help France lift the World Cup for the second time in their history, including a goal in the final against Croatia. Griezmann is likely to be stationed on the wing in a 4-2-3-1 just behind Olivier Giroud. As for Germany, the pressure is well and truly on boss Joachim Low to deliver, after a disastrous 3-0 defeat to rivals Holland last week. Die Mannschaft have struggled since crashing out at the group stages of the World Cup, and rumours are rife that Low could be dismissed after 12 years in charge of the national team should they be comprehensively beaten on Tuesday evening. Germany has failed to win or even score a goal in three of their last four outings in all competitions. However, you can never count out the Germans who can often find a way to win against the odds. France is unbeaten against Germany in their last four meetings going all the way back to the 2014 World Cup. Although the last time the sides met in the UEFA Nations League it did end in a 0-0 draw in Munich. In team news, Jerome Boateng is out through injury and expect Niklas Sule to cover at centre back. Sebastian Rudy could also be placed in midfield. Germany is in need of leadership, could Bayern defender Mats Hummels be able to supply it? 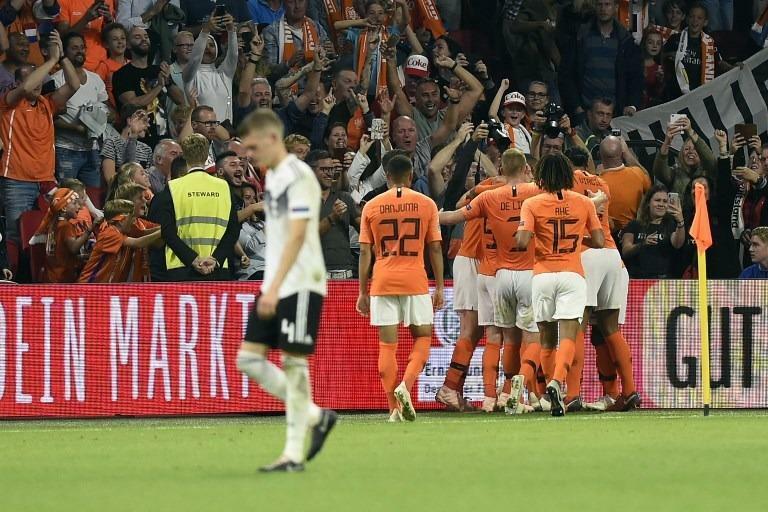 The 29-year old was outspoken in the aftermath of the defeat to Holland and could be fired up enough to inspire Die Mannschaft to a much-needed victory. Hummels is the senior defender in the side and will be expected to lead by example in Paris on Tuesday evening. It certainly promises to be a fascinating encounter as France look to maintain their strong start to the UEFA Nations League against Germany. Watch all the action Live & Exclusive on beIN SPORTS CONNECT.